We knew online advertising changes were coming. Facebook, under increasing pressure from the government, changed its targeting of consumers to avoid discrimination claims for things like housing and other industries. Let’s talk about big online advertising changes affecting Realtors marketing results. The funny thing is, many of the things we were targeting were not discriminatory at all. For instance, we used to target a group in Facebook “Likely to Move” or renters. Renters are always a good group of people to target as eventually many of them would love to own a home. Many Realtors would send out mail pieces to apartment complexes specifically targeting renters. I don’t see how targeting renters on Facebook is any different, but whatever it takes to satisfy the government, I guess. We believe going forward realtors will give up on Facebook advertising when they no longer get the results they’re used to, but they shouldn’t. This past week we had 4 open houses which we advertised in the newspaper as well as several online sites. Additionally, we selected 4 Facebook target groups. 2 groups were accepted. Facebook denied 2 groups even though I made the appropriate changes they suggested. Their system just wasn’t equipped to allow the ad. So, I spent most of the day yesterday studying their system. I was able to crack the code and I’ve identified several new targeted audiences I think will produce good results for our sellers. With every obstacle an opportunity is presented. Not only will these new audiences present opportunities, so will the failure of other online ads. When other Realtor’s ads are rejected, and they surely will be because Facebook doesn’t know any better, Realtors will give up. Their ads will either be less effective or won’t run at all. By spending a whole day studying the system, we’re betting this will pay off big for our clients. The other thing I think is important is we don’t put all our online eggs in one basket. The Ellis Team are huge advertisers on Google, Bing, Yahoo, and many other effective sites. We advertise where they online eyeballs are. If they shift, we shift. Facebook made these changes in August, and yet I just pulled up our online numbers. We have many websites, so I just picked LeeCountyOnline.com for a look. 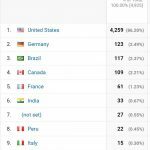 In the past 30 days we had almost 5,000 unique visitors. We’re able to track which country they come from, and even what state. We can track which pages they like, if they’re on desktop or mobile, and lots more. 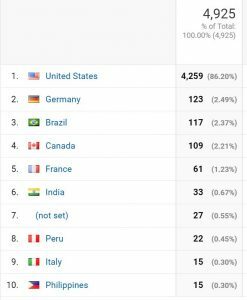 It’s interesting to note that Germany and Brazil are generating lots of visitors followed by Canada and France. 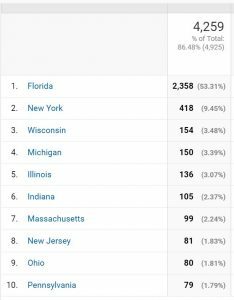 Inside the United States we note that New York and Wisconsin are the most popular outside of Florida. One of our buyer agents commented on how many people they are working with recently from Wisconsin. The online numbers bear that out. New York and New Jersey both made the top 10 list. It’s no surprise as taxes are high in those two states because they limit out on the SALT deduction, more are moving to Florida from those states. If you wish to attract foreign buyers, or buyers from other states you must have an effective online advertising strategy. As you can see from the stats, The Ellis Team has figured it out. Much of what we do is effective organic content, and much is paid search advertising. One without the other is only half a strategy. If you’re thinking of selling your home, please contact Brett or Sande Ellis 239-489-4042 Ext 4. We’ll show you how we can put our print and online advertising to work for you, so you too can reach these buyers. If you’re a buyer and you’ve found us, you can call us too, as we enjoy helping people buy their dream home in paradise. Remember, Always Call the Ellis Team at Keller Williams Realty! Visit www.SWFLhomevalues.com for a FREE online valuation of your home. It’s a great place to get started before you’re ready to meet with a Realtor.